It was fairly late in the day when I finally woke up on Wednesday morning, and I had had breakfast before going to bed. So I decided to forego the usually bacon and eggs and try some Texas-style barbecue, which generally means beef. Everyone had said that Franklin Bar-B-Q was the best, but I also knew that Franklin was an all-day proposition, and as badly as I wanted to try some beef brisket, I also wanted to do other things during the day as well, not spend it all waiting in line. So I had seen a place not all that far from my hotel called Rudy’s Bar-B-Que and Country Store, so I stopped there and decided to try their offerings. I didn’t know that they are considered one of the best barbecue places in Austin, but I can see why. Numerous times elsewhere I have ordered brisket and didn’t like what I got, but I loved the beef brisket I got at Rudy’s. I chose the lean brisket as I’m not a big fan of beef fat, and it was delicious, with a well-seasoned, smokey flavor that made the sauce almost superfluous. But the sauce was sweet and smokey as well, and made a nice addition. The inside is part dining hall and part country store, with long wooden tables the run the length of the room. Prices are not cheap, but neither are they outrageous, and the barbecue is really good. For those wanting to experience Austin barbecue without the four hours waiting in line, Rudy’s is a good option. I had left my car in East Austin, so after the Kool & Together show, I had a fairly long walk to my car, which was at the Carver Community Center. By now, I was a dead tired, but it was the satisfied kind of tired, so when I had driven out toward my hotel in Cedar Park, I stopped at the 24-hour Kerbey Lane Cafe out on Highway 183 for a midnight breakfast. While I was there, ferocious winds came up, and the weather became not merely cool but downright chilly. One of the cooler things about South By Southwest is the way that old and obscure bands are brought back into relevance, either by documentary films that are screened, or showcases that feature them. Victoria, Texas-based Kool & Together was just such a band, a group of Black musicians in a small Texas town who spent seven years recording a rather odd mix of soul, funk and psychedelic rock in the early 1970’s. When nothing really took off, they broke up. That would have been the end of the story, but in recent years record collectors got involved, as did the hip boutique label Light in the Attic Records, and the result was not just awakened interest in the old recordings, but a burst of new activity from the band itself. Although I had seen them play behind Fort Worth gospel mainstays The Relatives, I had never seen them perform their own show, so I was excited this year to get the opportunity to catch them on the rooftop at 512. As it turned out, the outdoor rooftop was the perfect venue for a band like Kool & Together, and although there was a fairly large group of people upstairs, the place didn’t seem at all uncomfortable. The band’s style is based around funk and soul, although elements of hard rock are included in a way that sets Kool & Together apart from other funk bands, and the audience seemed to enjoy every minute of it. 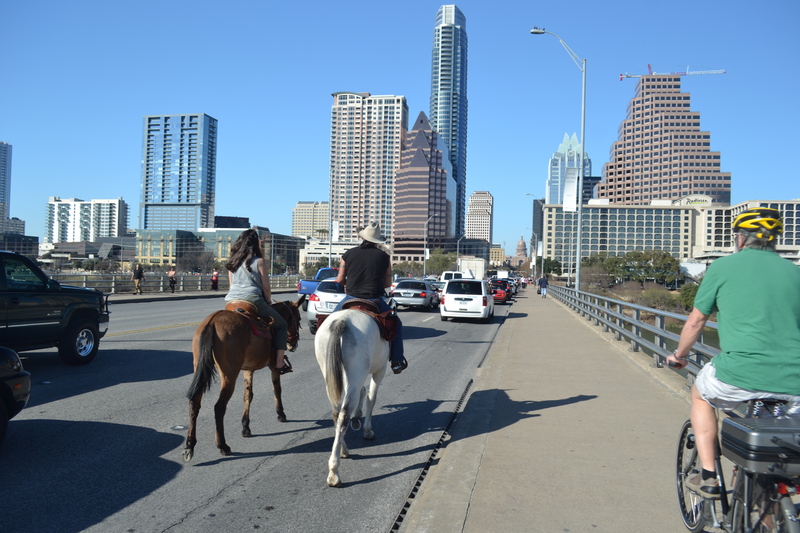 During South By Southwest in Austin, you learn to expect the unexpected. Also in South Austin is a record store called Friends of Sound, which can be hard to find despite its South Congress Avenue address, as it opens onto the alley behind. Unlike Waterloo or End of an Ear, Friends of Sound sells nothing new, and no formats other than vinyl. The emphasis is on soul and funk, especially 45’s, and some of the best and rarest ones often come through the store, particularly ones with a Texas connection. Prices are not low, but the selection of records that aren’t seen anywhere else is significant.